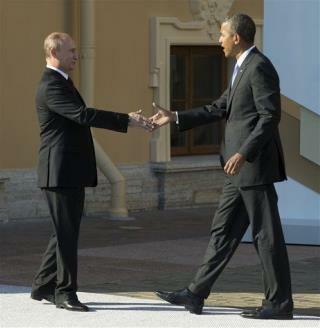 On Obama's Agenda: Historic Handshake? (Newser) – Today could bring what Time describes as the most historic handshake since "Nixon and Elvis" (or, more seriously, "Rabin and Arafat"): President Obama and new Iranian President Hasan Rouhani will meet for the first time at the UN General Assembly today, and everyone from government officials to the media is swirling over the possibility that leaders of the two nations could make their first "contact" since the country's 1979 Revolution. Amping up the situation: the setting, which previous president Mahmoud Ahmadinejad liked to use as a platform for questioning the Holocaust and the 9/11 attacks. Ted Cruz is smart and a Great American. How ridiculous and naive to think a handshake will negate 0bama's threats to destroy Iran by even greater sanctions on that nation's dealings with other countries. When 0bama was so completely embarrassed by Putin when he threatened an attack on Syria and Iran, one would think he'd just slither back to his bathhouse for comforting. But maybe his bath buddies there reject him too. Personally, I wouldn't trust his handshake either.